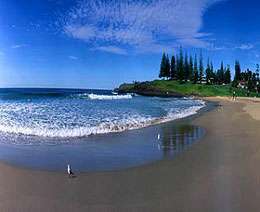 Austinmer Beach is one of the more popular beaches north of Wollongong. It lies next to Lawrence Hargraves Drive, with shops lining the western side and a large car park and park between the beach and the Drive. Norfolk Island pines back the length of the beach with the new Surf Club and other amenities occupying the southern half of this 250 m long beach. Two large rock pools lie on the southern rock platform. The pools were the subject of a famous 1918 painting by Alfred Coffey. The relatively small beach is wedged between two low headlands and their extensive rock platforms. A popular readily accessible beach offering all amenities, including a park and pools. However the surf is dominated by strong rips so stay between the flags. Surfing conditions: Possibly the most popular northern beach. It offers surfers a variety of beach breaks, with decent waves. A right breaks off the southern rocks into the rip with the central break depending on bar conditions. It receives waves averaging 1.4 m which result in 2 strong permanent rips against the rocks at each end. Usually an attached bar occupies the centre of the surf, however high waves can also cut a rip through this bar and generate a trough along the sloping beach face. The awesome two day gay girls' surf camps are held monthly at Bendalong, that's where I joined the Sydney Surf-Chix. The waves are great and I manged to do my first "drop" on the Bendalong waves:-). I rode my very first own surfboard here for the first time, it is called after this beach: Bendy-Blue! South Bondi, patrolled by Bondi Surf Club, is more exposed to waves and has a continuous bar cut by 2 to 3 rips and at time separated from the shore by a longshore trough. A persistent large and often strong rip runs out against the southern headland. This more hazardous area is more popular with the board riders than bathers. Consequently, while less popular for bathing, than the northern end of the beach, it has nearly twice as many rescues, 274 each year. Surfing conditions: North Bondi is protected from north easterlies and larger waves making it popular in summer and for beginners. During big swell Ben Buckler point produces a good left. The central portion is closed to boards, leaving the higher waves and strong rips of south Bondi to the board riders. 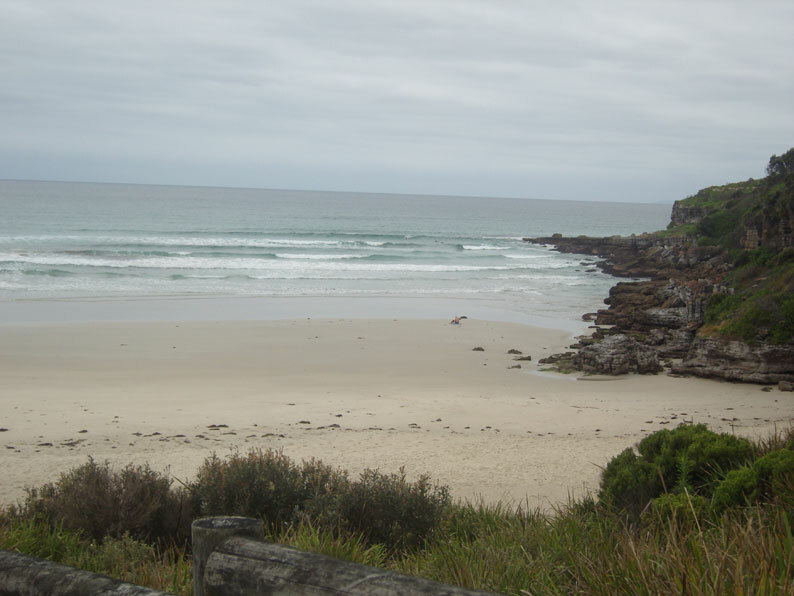 The beach breaks are of variable quality with the left into the southern headland rip holding waves up to 2.5 m.
Bulli Beach is 900 m long and runs south south east from 5 m high Waniora Point to the even lower Collins Rock. The Surf Club, founded in 1916, is located just to the south of the northern rocks with a commanding view down the beach. Next to the Surf Club is a large park with a caravan park just beyond. A small creek crosses south of the Club house and backs the northern half of the beach. A park backs the southern half. A bike path runs behind the beach linking Bulli with Woonona Beach. The southern half is more accessible from Woonona. The entire beach is exposed to waves averaging 1.5 m which cut the bar to form between 4 and 6 rips. Two permanent rips run out against the rocks at either end, with 2 to 4 shifting rips along the beach. The intervening bars are usually attached to the beach, but are separated by a trough during and following periods of high waves, conditions which can also generate a second outer bar running the length of the beach. Rock pools are located on both rock platforms. Surfing conditions: Beach breaks operate along the beach with quality depending on wave, wind and bar conditions. On the south side of Waniora Point are two gnarley breaks over the rocks, one a hollow left called Banzai. I have been surfing here once and it was great:-)! Will defenitely come back soon. 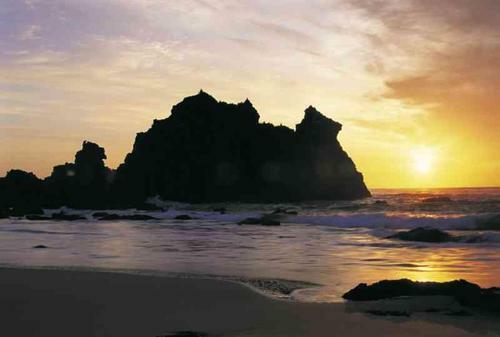 Camel Rock Beach is named after the rock formation replicating a camel on the northern end of the beach. 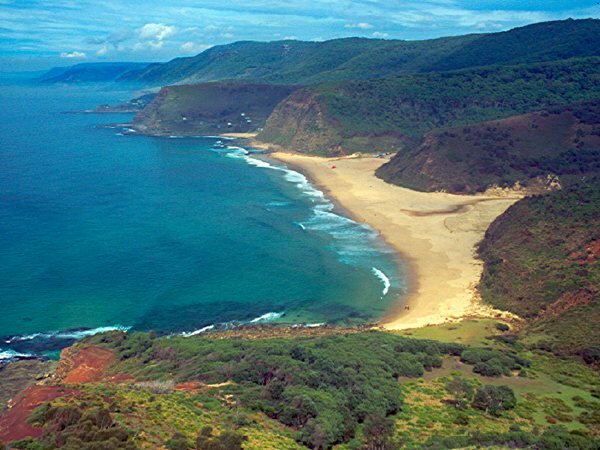 It is an unspoilt coastline with significant Aboriginal history. 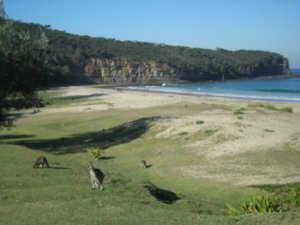 The beach is patrolled during January and picnic facilities are available for summer barbecues. Excellent coastal walks and a range of birdlife abounds. A viewing platform gives magnificent views up and down the coast. Surfing conditions: Board riders will find it one of the more consistent places to get a wave on the coast. It picks up the swell from every direction. Camel Rock is one of the few beaches protected from Bluebottles in a northeaster. Coalcliff as the name implies is the first of the mining towns that looked to the slopes and the coal seams for their livelihood and later to the sea for their recreation. The beach fronts a steep, narrow valley, with sides rising 300 m to the backing plateau. The coal mine is located towards the rear of the valley. A railway used to run from the mine to a small exposed harbour on the rock platforms about 2 km south of the beach. The Lawrence Hargraves Drive now winds between the mine and the town area, with access to the beach limited to a car park behind the Surf Club and street parking. The small Club was formed in 1924. 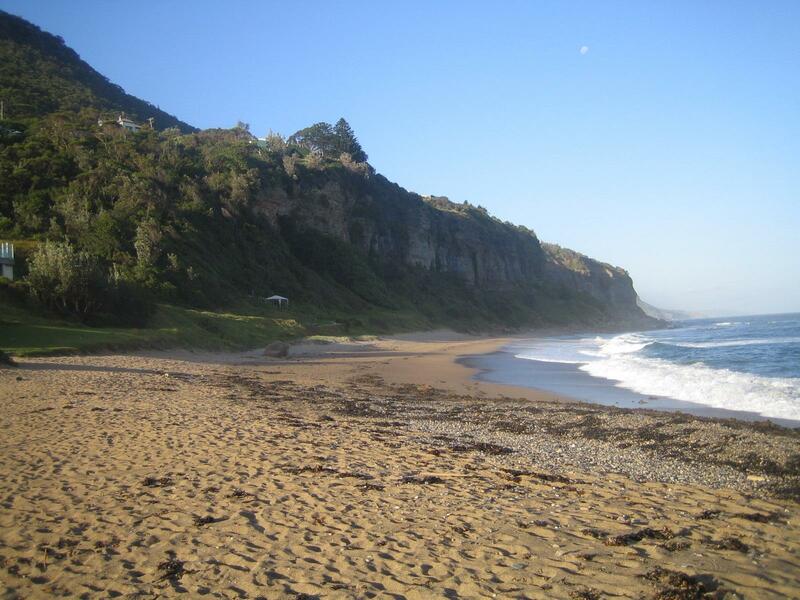 The main Coalcliff Beach fronts the valley, is 500 m long and faces the east south east. It lies between a southern rock platform containing a rock pool, and northern rocks that have fallen down the high cliff. Waves average 1 to 1.5 m producing 3 dominant rips on Coalcliff Beach, a strong rip against the southern rocks, a shifting central rip and one flowing north past the northern rocks. When the bars are separated from the beach the waves reform and surge heavily up the steep beach face. Surfing Conditions: Coalcliff offers protection from the southerly wind. It is a fickle break that is occasionally great. More a locals beach, with most surfing the central and southern beach breaks. Moderate swell produces a left off the northern reef and right off the southern bommie. 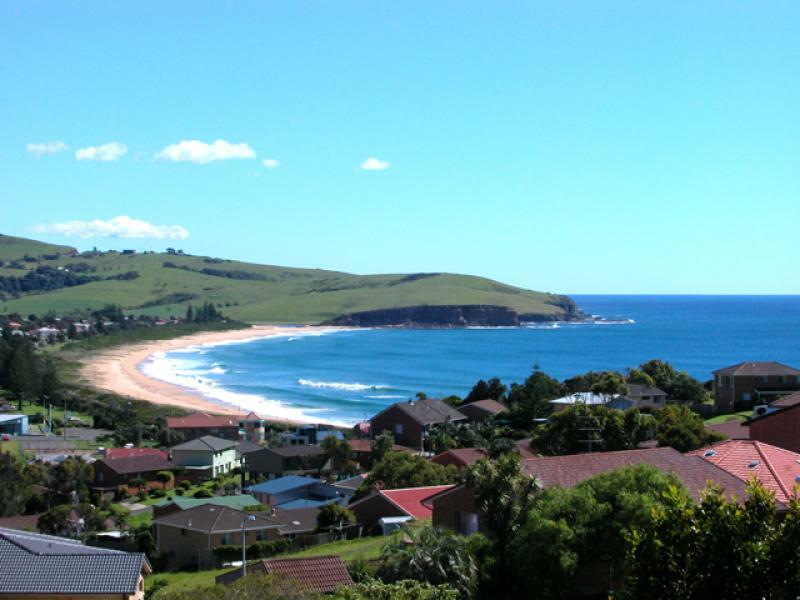 Coledale is a small seaside town approximately 18 kilometres north of Wollongong along the Princes Highway. 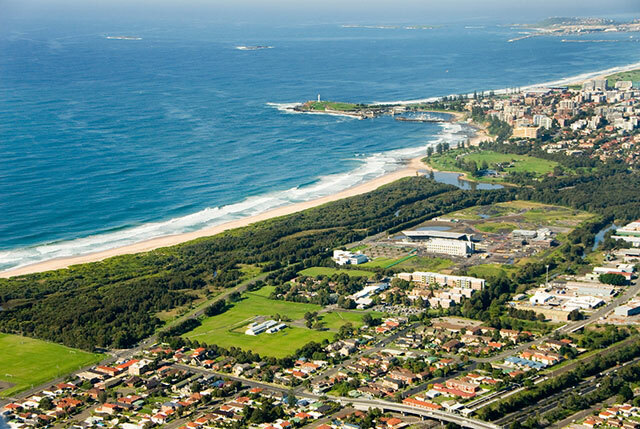 It is part of the City of Wollongong and lies between Austinmer and Wombarra. 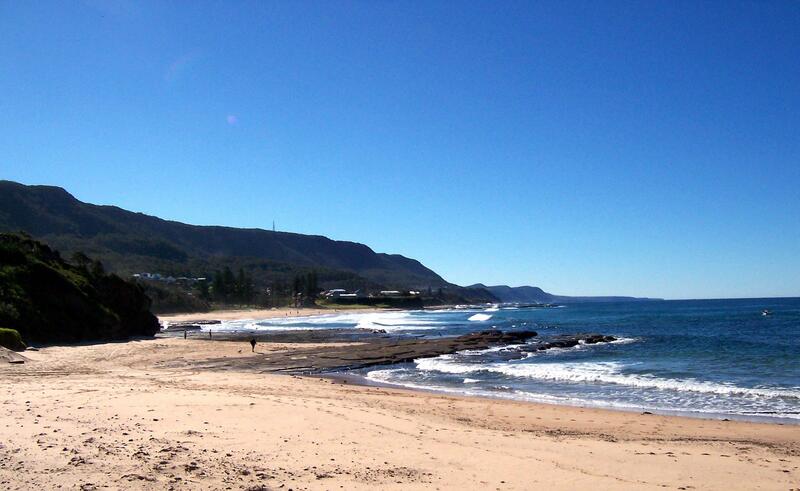 Coledale has two principal swimming beaches - Coledale and Sharky's. Both are reasonably lengthy, both have plenty of parking space and both are fringed by very fine rock platforms for investigating rock pools. 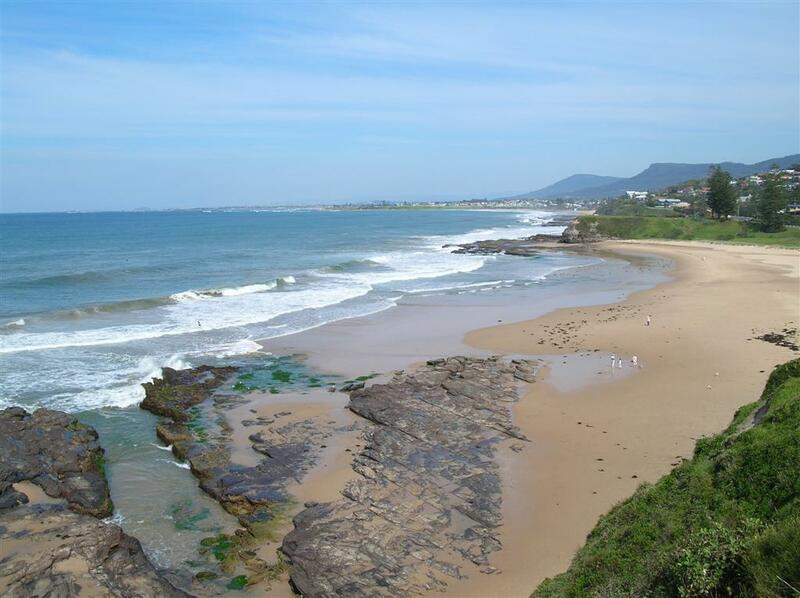 The main beach has a camping reserve (tel: 02 4227 5545) on the grassy foreshore, an amenities block, a surf lifesaving club and an ocean pool. On the southern side of the shops is another good, long beach with plentiful parking, although it is not patrolled: see Sharky's Beach. Surfing Conditions: there are great waves for kids, with the south end offereing good protection from the wind, and a wedging right-hander. Curl Curl is an exposed energetic beach, backed originally by large dunes which were destabilised earlier this century. The northern dunes were partly removed during the War, then used as a tip and finally returned to a somewhat natural state in the 1980's. Curl Curl, only 12 km from central Sydney, still has a relatively natural appearance. 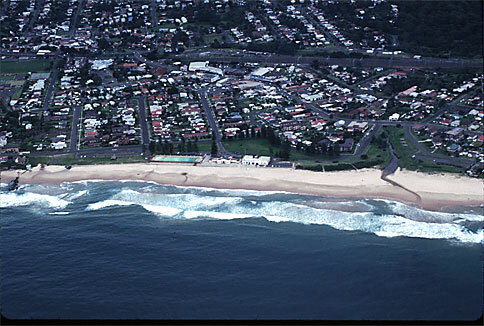 Today the central and northern end are given over to a foreshore reserve, with a large car park next to the North Curl Curl Surf Club and along the central section, while to the south the road runs close behind the beach with parking either side of the Surf Club and on the southern headland. Rock pools are located on the shore platforms of both headlands. 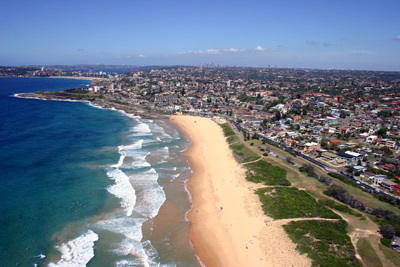 The beach is 1.2 km long, lying between 50 m high Dee Why Head and the lower sandstone rocks at South Curl Curl. It faces the east south east and receives all swell out of the east and south east with waves averaging 1.6 m. These waves cut the single bar to usually produce 7 rips, two permanent against each headland, and 5 shifting rips along the beach. Because of the higher waves the bar is often separated from the beach by a continuous trough occupied by the rips and their feeder currents. During lower waves the bar attaches between the rips. The rips however are always present. 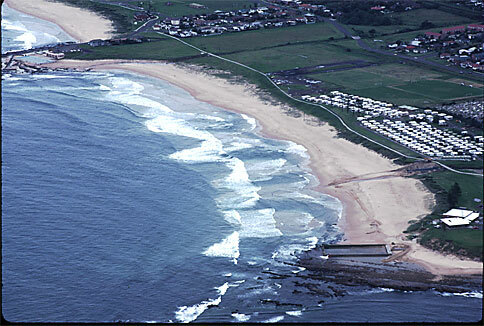 North Curl Curl's original attraction was the lagoon and beach. The lagoon which still flows across the beach during heavy rains went through a phase of serious pollution and is only now being cleaned up. The beach is safest and most attractive in the northern corner particularly in summer, and popular with families. Strong, persistent rips occur south of the Club house. Surfing Conditions: South Curlie also offers beach breaks and a regular swell. Best is in the south just north of the main rip, with other breaks up the beach. Exposed to both summer north east winds and southerlies. North Curlies as the locals call it can usually produce a wave when there is little else around. With low to moderate swell it can generate some good beach breaks along the entire beach. Its blown out however in southerlies. Dee Why has a lot to offer with surf being top of the list. If you find the surf and rips too much enjoy the parks and rock pool. Dee Why is definitely more civilised and developed than Long Reef. A seawall, Surf Club, large car park and nice park back the southern beach with all the usual beach shops behind. Surfing Conditions: Up the beach No Man's Land provides some of the north sides best beach breaks and always seems to have a wave no matter how low the swell. Down south inside the point is a kiddies corner when the waves are lower with learners having a go. However when the swell exceeds 1.5 m Dee Why Point starts to work, holding up to 4 m. It has a steep take off over rocks, with the locals sitting way inside, followed by a tube and a full shoulder. Popular but not for the faint hearted. However the non surfers can enjoy a front row view of the break from the Point, which the surfers also use to launch themselves into the cauldron. Elouera,the long beach from Greenhills to North Cronulla offers three surf clubs in the south, fronted by strong rips, with wave height gradually decreasing to the north as do the crowds. Most people prefer the more crowded south where the surf and all amenities are provided, particularly if coming by car, where they are joined by surfers arriving by train. For solitude head north. 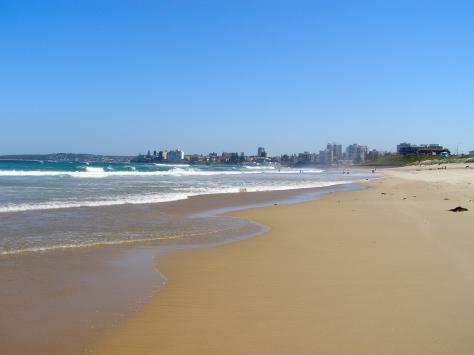 Along this section of beach, all the way down to North Cronulla, not only are there rips every 200 m, but the bars that separate them are usually detached from the shore, with an often deep trough running between the bar and the shore. This combines with a relatively steep beach face and at times heavy to surging shorebreak, to produce a potentially hazardous beach. Surfing Conditions: The deep rips and bars can combine to produce some excellent beach breaks right along the beach, however it depends on the waves, winds and bars. Best following big seas, east to south east swell and offshore winds. Elouera, The Wall and The Alley are some of the more popular spots, when working. 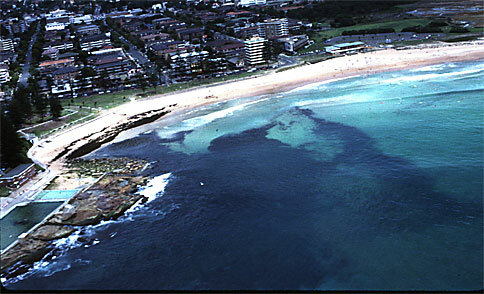 Freshwater Beach is the first beach North of Manly on the Peninsular. A beautiful beach flanked by a headland at each end. Can produce excellent surf. The beach has a large rock pool at the Northern end. A beach patrolled by lifeguards it has its own surf lifesaving club where you can buy stuff in the summer. At the back of the beach is the highly acclaimed Freswater Restaurant and a hundred meters from there is the Harbord Beach Hotel (Pub) known as the Harbord Hilton to the locals. I have been surfing here once and it was great:-)... Nice long rides! Fairy Meadow Surf Club, 1.3 km to the south, is reached by a road across the former swamp. A car park and dressing sheds are provided immediately behind the dune. 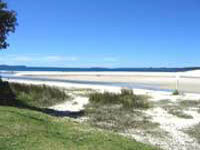 Midway between the two Surf Clubs is a large caravan park with foot access across the creek and dunes to the beach. 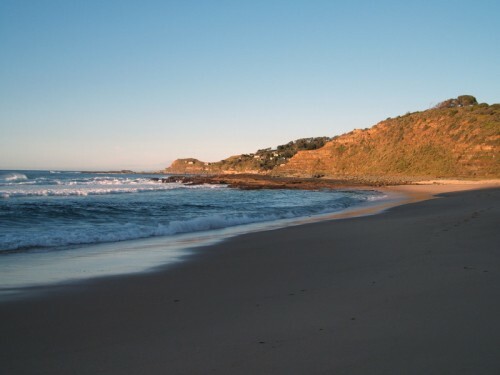 The 1.5 km of beach south of the Fairy Meadow Surf Cub is only accessible on foot from the Surf Club or from the southern end. 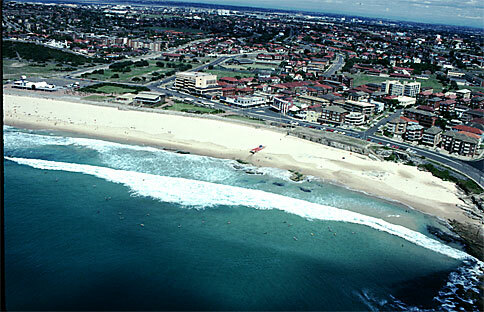 Surfing conditions: The beach receives waves averaging 1.5 m in the centre - north, dropping to 1 m toward the south. They produce a single bar cut by rips every 200 m, resulting in up to 14 rips along the beach, with rip size and strength increasing up the beach. The intervening bar is attached during periods of lower waves, particularly to the south, while higher waves will produce a continuous trough occupies by rip feeder currents, and occasionally a second outer bar along the northern half of the beach. Only beach breaks with conditions depending on the waves, wind and bars. Only about an hour's drive south of central Sydney, Garie is a cracking little break nestled among the rugged beauty of the world's second oldest national park. Flanked by towering cliffs, it's a picturesque spot and the surf is fairly reliable all year round. Both ground swells and wind swells ensure a consistent break and while there's normally plenty of room, it can get a little busier if the surf is really pumping. Be mindful of locals, rocks and some pretty hefty rips. The surf near Green Island at Conjola (access from Manyana/ Cunjurong Point) provides excellent board riding for enthusiasts and there are plenty of spots for spear fishing and scuba diving. Surfing Conditions: This beach offers a fun, summer wave, depending on the sand-banks. Manly Beach is probably Australia's best know beach, after Bondi. There is still debate as to whether the world's first Surf Life Saving Club was formed here, but there is no doubt that this is where in 1902 one man helped shake the shackles that had for decades kept Australia's growing interest in the beach and surf at bay. Within a year of William Gocher defying the law and bathing in daylight hours on Manly beach, the floodgates had opened and Australian's began flocking to the beach to walk, bathe and attempt to come to terms with the waves and rips. During the first official bathing season in 1903, 17 people drowned on Manly Beach. A year latter a Surf Club was formed on the beach to safeguard the public, perhaps the world's first. 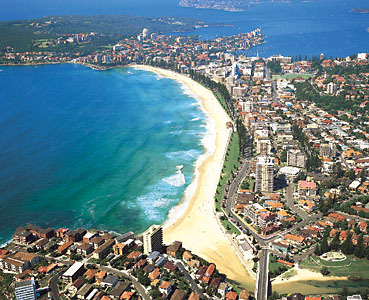 The present Manly SLSC formed in 1911, North Steyne 600 m to the north in 1907 and Queenscliff in 1924.Manly - Queenscliff Beach faces the east, is 1.4 km long and receives waves averaging 1.5 m at Queenscliff dropping toward 1 m at Manly. 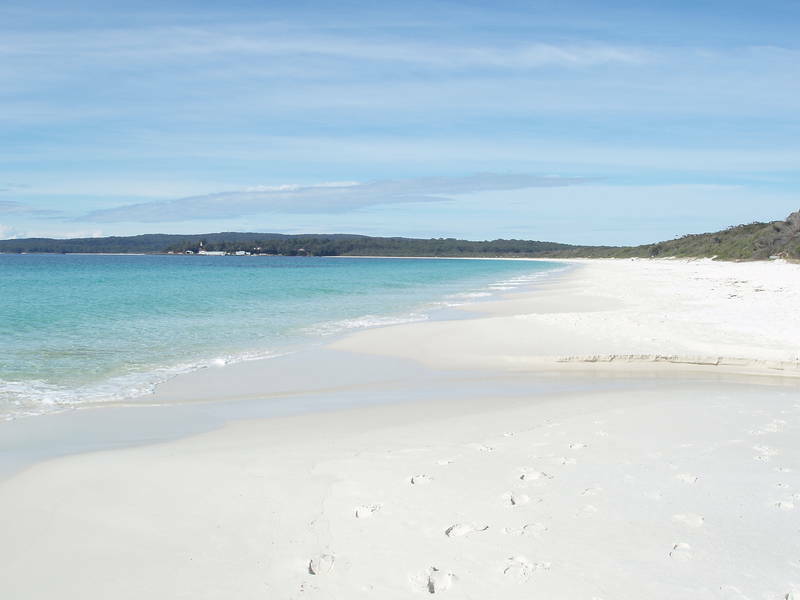 The sand is whiter and finer than many northern beaches resulting in a flatter wider beach slope and surf zone. Up to 8 rips flow across the bar, with permanent rips against Queenscliff Head and Manly Point, the latter called The Escalator. During big seas the finer sand and waves combine to produce a second bar off Manly with more widely spaced rips. Surfing Conditions: Usually reasonable beach breaks, with a left running into the Escalator. When the swell is up Manly Point puts on a reasonable right. 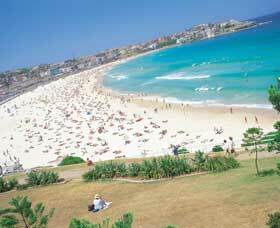 Maroubra Beach at 1 km in length is the longest beach in the Eastern Suburbs. It is orientated due east, and apart from the very southern end receives the full force of Tasman Sea, producing the most hazardous beach in the area. The beach is a popular destination, with city buses and a large car park. Byrne Reserve which backs much of the beach also provides plenty of space to spread out. The Marouba Surf Club was formed at the northern end of the beach in 1904, while at the southern end, South Marouba Surf Club is one of the newest forming in 1963. While the beach has excellent parking and facilities, the surf requires more caution. The northern and central section of the beach are dominated by 4 to 5 rip systems, which are particularly strong in the north and against the northern headland. Also rocks and a drain at the northern end pose additional hazards. Marouba Surf Club patrols the northern end and hauls in 285 people a year, the state's highest, at an equally high rate of 3.4 per thousand bathers. 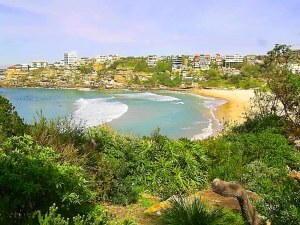 Surfing conditions: This is the surfing beach for the Eastern Suburbs, with consistent reef and beach breaks. The Toilet Bowl in the north produces both lefts and right depending on swell direction, while Marouba Reef in the south provides good, hollow rights in north east to east swell. Usually good beach breaks during winter. Surfing Conditions: Located at the south end of Thirroul, Macauley's offers peaky left-handers. One of the beaches I have had two of my surf lessons with Peter Hunt, who goes here with his students as this beach is quite protected at the South end, and beginners can catch the white wash. I have tried twice at the North end, which is fine, but only at times where the local guys are not on the waves:-)! 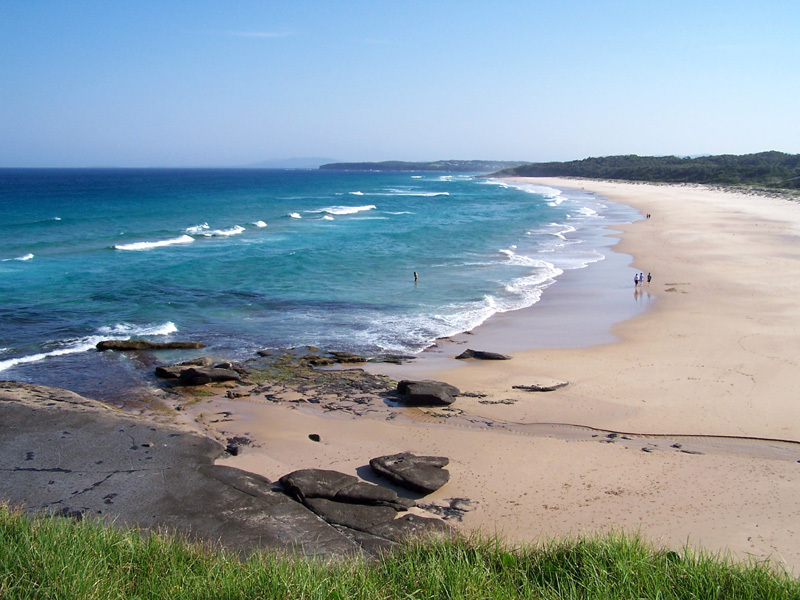 At 6 km long, Merimbula - Pambula Beach (see below) is one of the longest on the Far South Coast. The beach begins at Merimbula Lake mouth which flows out against Merimbula Head and forms extensive tidal shoals and channels. 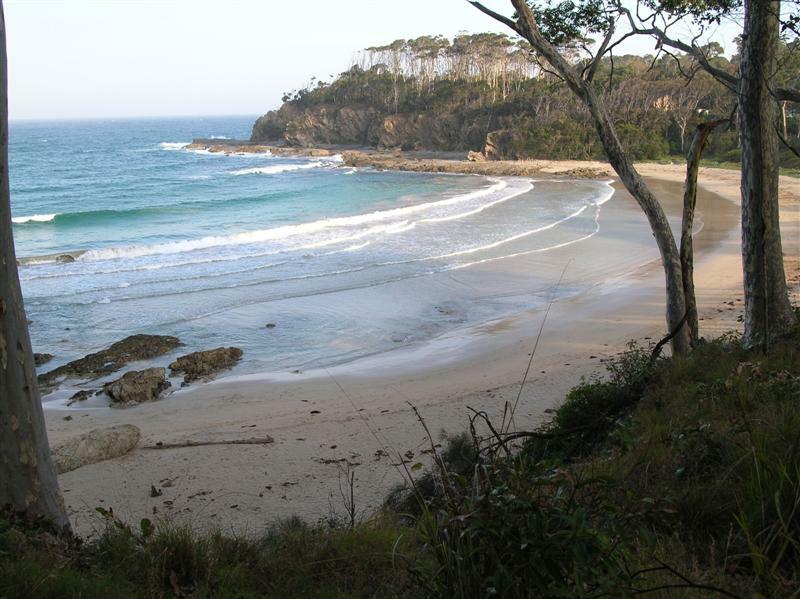 The beach then sweeps in a broad east facing arc down to the shaly rocks at Pambula. The beach is backed by a low sand barrier that formed following the rise in sea level 6 500 years ago. The barrier built seaward some 400 m forming a series of low dune ridges. In the north these are now covered by residential development, with good access and parking to the beach. A Surf Club existed at Merimbula Beach for some years, however it is now defunct and the beach is patrolled in summer by lifeguards. Most of the central beach is undeveloped with two vehicle tracks leading to the beach. The southern end is accessed via Pambula and leads to Pambula Beach settlement with its beach front caravan park and Surf Club founded in 1930. The beach consists of fine to medium sand which combined with the waves averaging 1.5 m results in a double bar system. The inner bar runs the length of the beach and is usually cut by rips every 200 to 300 m, resulting in up to 30 rips along the beach. A longshore trough separates it from the outer bar which is cut by more widely spaced rips. 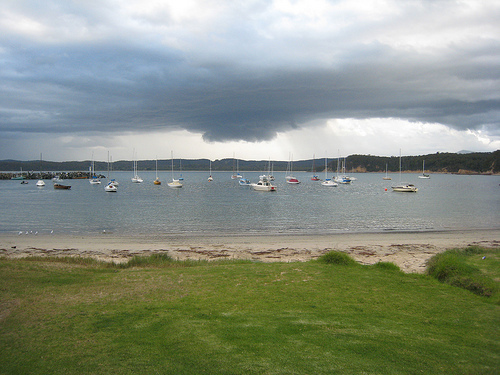 At Merimbula the beach runs into the Lake mouth with its strong tidal currents and deep channel. At Pambula a strong rip often runs out against the southern rocks. 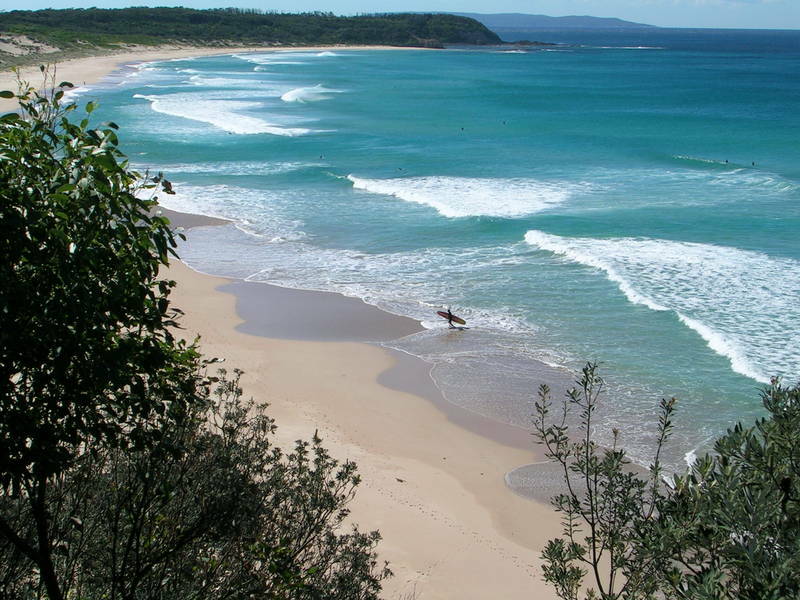 Surfing Conditions: To surfers Merimbula Bar is the name given to the seaward side of the tidal shoals. It is well known for its fast, long left break that holds up to 3 m. Beach breaks also abound all the way down to Pambula. The beach is also very popular with wind surfers. I have been spend a couple of days at Merimbula. Have been surfing at Short Point Beach with quite big and strong waves... and at Bar Beach, which offers smooth small waves with long rides. 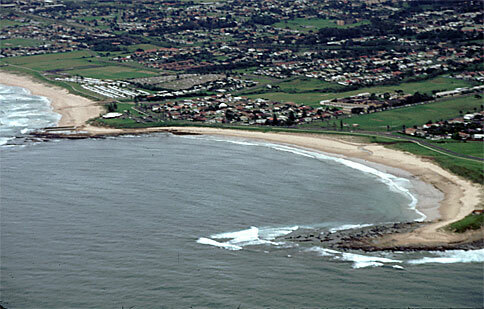 North Wollongong Beach is the city beach for Wollongong. It lies just to the north of the downtown area. 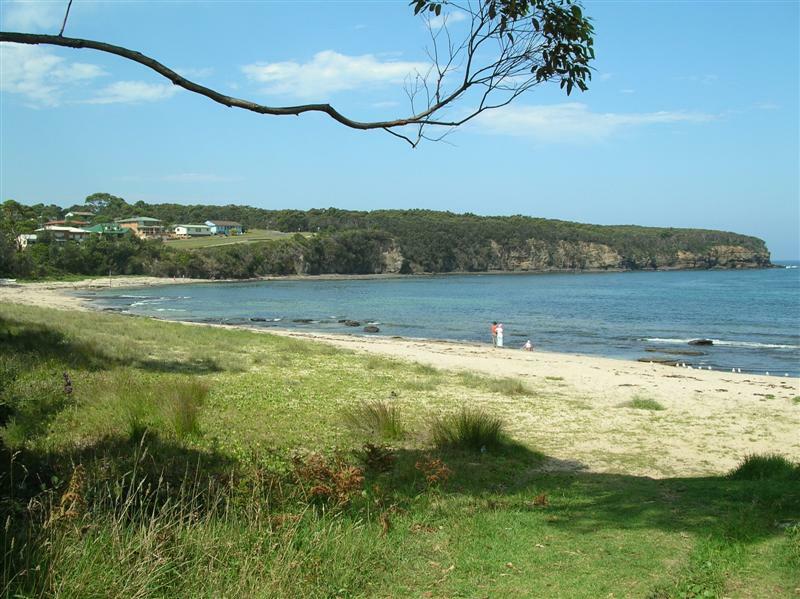 The beach is just 500 m in length and backed by bluffs rising in the south to 30 m. It is separated from the northern Fairy Meadow Beach by low rocks. A large park, with picnic facilities and plenty of parking backs the northern end. In the south a wide rock platform lies between the beach and the Wollongong Boat Harbour. A series of rock, wading and swimming pools occupy the southern section of this platform. The present Surf Club sits in the centre of the beach. A walkway - bike path runs from this park along the top of the beach to Wollongong Boat Harbour. Surfing conditions: The beach is orientated to the east north east and receive some protection from south east waves from Flagstaff Point, with waves averaging 1.2 m in height. The waves produce a single bar which is usually attached to the beach but cut by 3 to 4 rips. Under normal conditions the rips are small and infill with sand following periods of low waves. However when waves exceed 1 m and during summer north east waves the rips intensify and create problems that result in 75 people being rescued annually at this popular beach. Usually low beach breaks and lots of surfers, it can hold reasonable waves to 2 m.
Along Palm Beach there is heavy development which tends to restrict access and parking, while the seawall, when exposed, also restricts access to the beach and even the size of the beach, particularly at high tide. Palm Beach Surf Life Saving Club (1593C) was established in 1930, when it was known as the City of Brisbane Surf Life Saving Club. The club sits just off the highway and is surrounded by a large car park, with a patch of grassy reserve and a seawall running along the front of the club house. Surfing conditions: There are beach breaks along the length of the beach, both on the inner bar during low waves and on the outer bar during moderate swell. 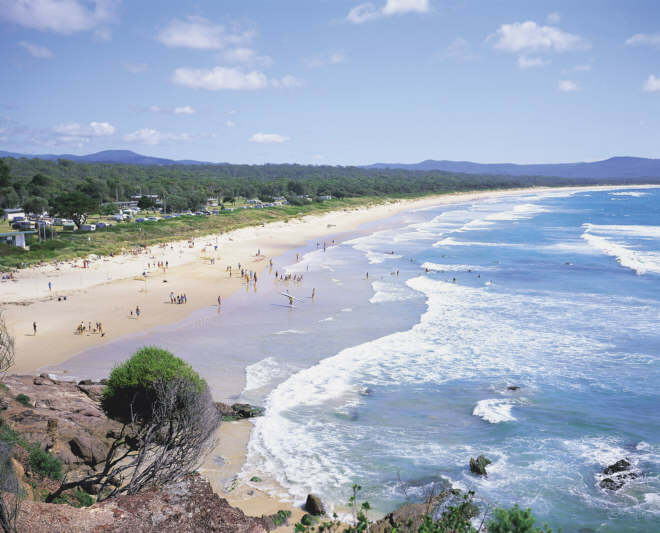 At 6 km long, Merimbula - Pambula Beach is one of the longest on the Far South Coast. The beach begins at Merimbula Lake mouth which flows out against Merimbula Head and forms extensive tidal shoals and channels. The beach then sweeps in a broad east facing arc down to the shaly rocks at Pambula. The beach is backed by a low sand barrier that formed following the rise in sea level 6 500 years ago. The barrier built seaward some 400 m forming a series of low dune ridges. In the north these are now covered by residential development, with good access and parking to the beach. A Surf Club existed at Merimbula Beach for some years, however it is now defunct and the beach is patrolled in summer by lifeguards. Most of the central beach is undeveloped with two vehicle tracks leading to the beach. The southern end is accessed via Pambula and leads to Pambula Beach settlement with its beach front caravan park and Surf Club founded in 1930. The beach consists of fine to medium sand which combined with the waves averaging 1.5 m results in a double bar system. The inner bar runs the length of the beach and is usually cut by rips every 200 to 300 m, resulting in up to 30 rips along the beach. A longshore trough separates it from the outer bar which is cut by more widely spaced rips. At Merimbula the beach runs into the Lake mouth with its strong tidal currents and deep channel. At Pambula a strong rip often runs out against the southern rocks. I have been surfing here twice and had lots of fun both times! I will definitely come back here! Sandon Point Beach sweeps in an east facing arc for 900 m between Bulli (Sandon) Point and Waniora Point, the latter extending as a reef 500 m out to sea. At the northern end a large car park backs the Surf Club, the newest in the area formed in 1959. 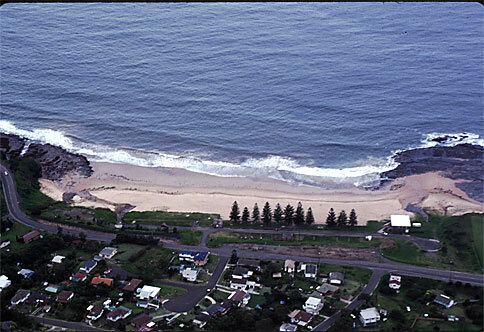 A road runs the length of the beach past Bulli Park to the residential area in the south. Good access via walkways is provided the length of the beach. Waves average 1 m in the north, dropping to 0.5 m in lee of the southern point and reefs. As a result the bar is usually attached the length of the beach with 2 or 3 rips forming along the northern half, however even these can infill during periods of low waves. The result is a relatively safe beach which has an average of only 7 rescues each year. Surfing Conditions: The beach usually offers low to moderate beach breaks which close out on the bar. 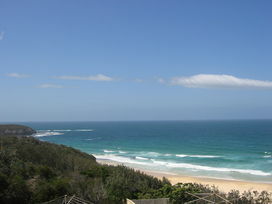 The northern Sandon Point, described above has the famous right on the north side, as well as a less famous left running in toward the beach. Out on the southern point and reef is a right, known to surfers as Peggys, in moderate to large east to south east swell it produces a powerful break. Sharkys is the next beach to the south from Coledale Beach and can be reached, except at high tide, by foot from the main beach. It is on the southern side of the shops. Just north of Sharky's, back toward the main beach, is a small pool filled with ocean water. Whales can be seen off the shore at Coledale from May (sometime not until June), as they head north for warmer waters. They can sometimes be seen again around August to October, as they return with young calves to the Southern Ocean. Humpback and southern right whales are the most common species. Surfing Conditions: One of the best known surfing beaches, Sharkys offers what the locals refer to as a fun wave with a left and right-hand peak, and sand over the reef. Surfing conditions: The beach faces the southeast and is exposed to east and southeast waves. It receives waves averaging 1.6 m which usually generate four strong rips, two against each headland, and two and sometimes three shifting central rips. The bar separating the rips is often separated from the beach by a wide, deep trough, with waves reforming to surge up the steep beach face. Following periods of lower waves the bar attaches to the beach between the rips. The conditions that result in hazardous bathing also produce some good breaks on the bars with lefts and rights running into the rips. Best in low to moderate east and southeast swell and offshore winds. 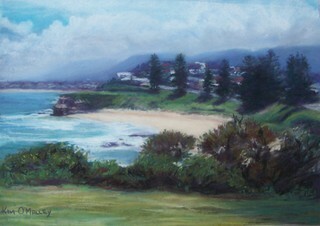 Thirroul Beach became a popular beach at the turn of the century. Today Thirroul can cater to large crowds. The entire beach is backed by a wide, grassed reserve offering parking, parks, playgrounds and picnic areas. A large park also surrounds the now drained lagoon behind the northern end of the beach. The Surf Club occupied the centre, with dressing sheds and a full size Olympic pool and wading pool next door. The beach is 1 km long and faces the east south east. 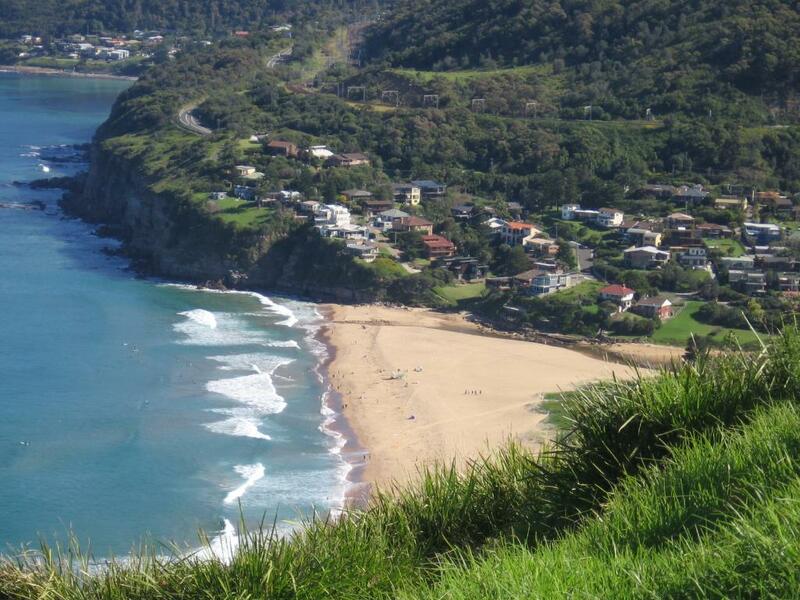 In the north low headlands fronted by wide rock platforms separate it from Austinmer, while in the south a pipeline and few rocks at the base of low bluffs divide it from South Thirroul Beach. Surfing conditions: Waves average 1 to 1.5 m producing a single bar usually cut by 6 rips. The bar between the rips is usually attached to the shore but detaches during and following high waves to form a continuous trough whose currents feed the rips. Permanent rips run out against the northern and southern rocks, with the others being more transient. Beach breaks run right along the beach with the quality depending on bar and wave conditions. 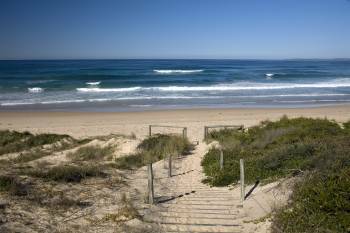 Surfing conditions: Wombarra is an exposed beach break that has quite consistent surf. Summer offers the favoured conditions for surfing. Works best in offshore winds from the south southwest.Windswells and groundswells in equal measure and the best swell direction is from the southeast The beah breaks peel to the right. Surfable at all stages of the tide. It very rarely gets crowded here. Take care of urchins, rips, rocks, obstacles, locals and sharks. It can be outstanding and is best in southerly conditions. 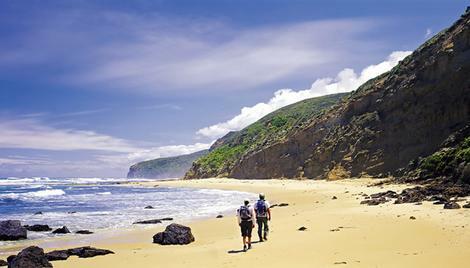 Two kilometre long Woonona - Bellambi Beach begins on the south side of Collins Rock and runs to the south toward Bellambi Point. The point extends 1 km seaward sheltering the southern end and causing the Bellambi section to face the north east. 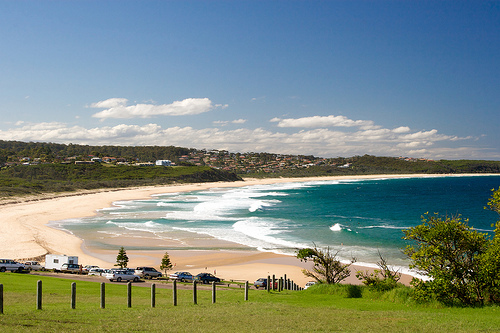 This popular beach has two Surf Clubs, Woonona in the north founded in 1913 and Bellambi to the south founded in 1909. The Woonona end has a rock pool on the shore platform, with a car park, park and picnic area on the bluff behind. The Surf Club is located on the foredune just to the south. A beach front oval and a road run for 500 m behind the northern section of the beach. Surfing Conditions: The northern half of the beach receives waves averaging 1 to 1.5 m and usually has an attached bar cut by rips every 200 m with a permanent rip against the northern rocks. During big seas a second bar forms further offshore. 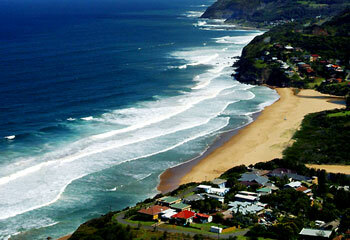 Woonona is a popular summer beach with the beach breaks providing lefts and rights down the beach.